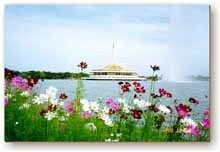 King Rama IX Park is an expression of gratitude from the people of Bangkok to H.M. King Bumibol Adulyadej on the occasion of his 60th birthday in 1987. The 200 acre park is Thailand's first comprehensive botanical garden, providing a relaxing environment. It has six distinct areas, each with its own specific theme. The Garden of the Great King or Uthayan Maharaj, symbolizes the Sovereign Grace and Majesty is the first and most important area. Area two is the botanical garden where research is conducted on varies types of flora and the knowledge gained is passed on. The Reservoir at area three is named Traphang Keo and truly exemplifies His Majestys efforts to mitigate flooding in Bangkok as it adds to the effectiveness of the project he has proposed. The Rommaniya Garden" in area four is an open garden with miniature reproductions of Thailand's natural heritage including mountains and other geological features. Area five is an open field for use for entertainment and festival purposes. It is called Sanam Rasdara which means Royal Ground. There are mixed jungle and wetlands providing habitats for fish and waterfowl in area six. In addition to these main areas, there are also seven international miniature gardens that were created with the assistance of experts from each of the countries represented. Open : Daily 5 am. to 5 pm.